Fun With Frisian: DE WÂLDSANG - "The Forest Song"
DE WÂLDSANG - "The Forest Song"
After my summer vacation, I'm in the mood for another song. "De Maitiid" was nice enough, but it is time to expand our Frisian musical repertoire. Let's take a look at "De Wâldsang" by Harmen Sytstra. You can read the lyrics here (however, some of the spelling there is old-style) and listen to Anneke Douma singing the song here. Wâld is West Frisian for "forest." Say it with an initial v- and a long "ah" as in "father. VAHLD. The plural -en ending is said with a schwa. VAHLD-duhn. Be careful not to confuse the word for "forest" with wrâld, meaning "world." VRAHLD. You can refer back to their English equivalents to keep them straight: the woods are in the wild. Meanwhile, "world" has an -r- in it just like its Frisian cousin. Sang is a cognate meaning "song." Pronounce it with the long "ah" as in "father" so that it sounds a lot like the English word "song"--not like English "sang"! I'll start off translating the first few lines for now. Moai is a word we've seen before, in a previous musical lesson. It means "beautiful," "nice," or "lovely" and is said with the "oy" ending heard in the English "joy." MOY. Sûnder means "without." Say it with the long "oo" in "moon" and with a schwa in the second syllable. SOONduhr. Wjergea, as near as I can piece together, means "equal." P. Sipma's text from 1913 was the most helpful source that I could find for translating this word, under his entry wjergeade. Say the first syllable with an initial v- followed by a -y- gliding into an "eh" as in "vet". The second syllable takes an "ih" as in "bit" followed by a schwa. VYEHr-gih-uh. Binne means "are" and has a nice, straightforward pronunciation. Say it just like the English word "bin" followed by a schwa. BIHN-nuh. De means "the" and takes a schwa. DUH. The snug/pleasant shadows of the trees' green are everywhere about. Smûk is said with a long "oo" as in "moon," but the meaning is going to be an educated guess: my best hypothesis at this time is that it means "snug," but please send me a correction if this is in error. I also found a loose Dutch translation indicating that it might mean "pleasant." SMOOk. Skaad is West Frisian for "shade" or "shadow." Say it with a particularly long "ah" as in "father." In older sources such as P. Sipma's glossary, it is spelled skaed. SKAAHd. Beamte means "trees" or "a cluster of trees." It is pronounced with a -y- gliding into an "eh" as in "Emma" (or "Thames" if you are feeling British). The final syllable takes a schwa. BYEHm-tuh. Grien is a nice, convenient cognate. It means "green" and is said very much like its English equivalent, except that there is a schwa after the long "ee" vowel. GREE-uhn. Yn is said with the long "ee" vowel in "seen." It means "in." 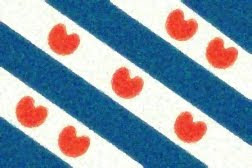 Remember that it, the Frisian word for "the" or "it," sometimes gets shortened to 't. The full word is said with a schwa, rhyming with the English word "cut." Finally, rûn means "round," "around," or "about." Say it just like the English word "rune," with a long "oo" vowel. ROON.